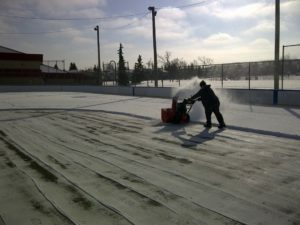 Thank you to all our Rink Rat Volunteers for maintaining both rinks over one of the longest skating seasons in memory! First flood of the season at the hockey rink was November 4/17 with the last flood occurring March 8/18. The ice at the hockey rink is quickly disappearing and soon it will be basketball & ball hockey time…enjoy the other season! As March approaches and the sun gets higher in the sky, the days the ice remains in the rink becomes numbered. The ice along the north side of the rink by the benches is first to go because the sun heats up the asphalt there and the ice quickly disappears. We have two floods scheduled this week and will play it day by day pending the sun and the forecast. So get out there and enjoy the hockey rink before its gone and basketball season begins! Forecast calling for the return of old man winter so we will attempt to get a flood down before that occurs Tuesday night. 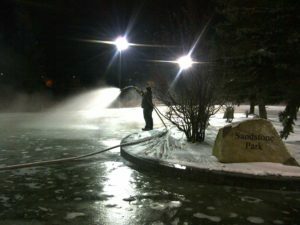 Thank you for continuing to assist the volunteers, when flooding begins please vacate the rink. January 1/18 – Happy New Year! Flood Schedule for the remainder of 2017…pending weather, it may be too cold to flood! Thank you to the volunteers who came out to start the flooding procedure again at the hockey rink. We will do daily floods to get the rink operational, hopefully on Christmas Eve! Please do NOT skate on the rink just yet as there is still exposed asphalt that will result in injuries (face-plants). Due to warm weather flooding has been suspended at both rinks. For everyone’s safety please stay off the surfaces until flooding resumes, with the long range forecast that could be Sunday, December 3rd…stay tuned! 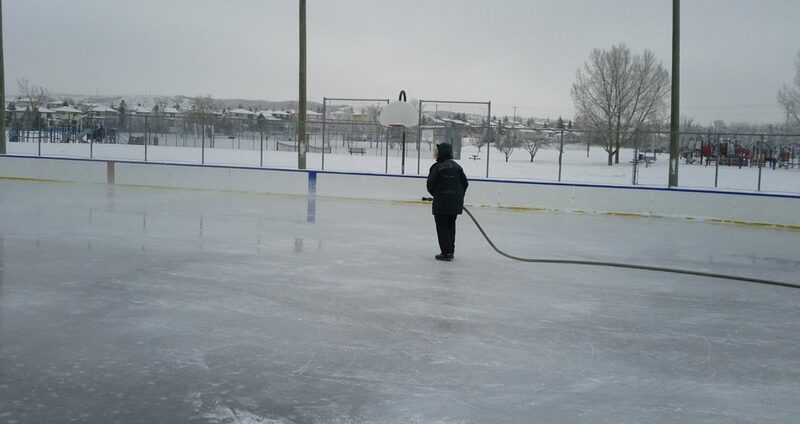 Flooding continues at both SMCA hockey and pleasure rinks this week. The pleasure rink is NOT yet open, we will continue to flood this week with an anticipated opening date of November 25th! Follow us on Facebook (@sandstonemacewan) and Twitter (@sandstonemac) for more rink fun. SMCA is looking for rink volunteers to join our Rink Rat Team and help flood the pleasure and hockey rinks in our community. Its a great excuse to get outside for some exercise & fresh air in the winter…and it’s fun!